At the dawn of time, two ancient adversaries battled for control of Earth. One man rose to stand at humanity's side. A man whose name we still remember today… The legend about the greatest superhero to ever walk the Earth continues in Prince of Tyre. Mikhail has a new mission: train the warriors to fight back against the mysterious kidnappings so his adopted village will be safe for Ninsianna and their expected child. But the journey from soldier to general is never easy, especially when the Chief's son undermines his authority. Challenges compound when they learn 'lizard demons' have put a bounty on Mikhail's head. Ninsianna thought her prayers had been answered when a man fell from the heavens and vowed to protect her village. But She-Who-Is is a demanding mistress—not only does she send nightmares of impending evil—but she causes her to view her husband with a pragmatic, and often self-serving eye. Can their marriage survive possession by a goddess? Or will She-Who-Is' power corrupt Ninsianna? Meanwhile in the heavens, rumors of a cure to the Angelic's impending extinction winds its way through the Emperor's desperate armies. Raphael is charged with finding this 'Holy Grail,' unaware that Lucifer barters the solution in a quiet coup d'etat. The Eternal Emperor and Shay'tan are so busy outwitting each other that neither notices Lucifer is a little 'off,' or that an ancient Evil is outmaneuvering them all. A tragic death forces the Alliance to choose which leader they will follow in an epic, heavens-fracturing showdown. The Eternal Emperor … or Lucifer? 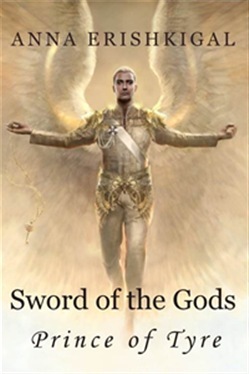 Sword of the Gods reading order: The Chosen One Prince of Tyre Agents of Ki The Dark Lord's Vessel The Fairy General (coming soon) Angel of Death: A Love Story - set in the same universe, but in the modern day. Acquista Sword of the Gods: Prince of Tyre in Epub: dopo aver letto l’ebook Sword of the Gods: Prince of Tyre di Anna Erishkigal ti invitiamo a lasciarci una Recensione qui sotto: sarà utile agli utenti che non abbiano ancora letto questo libro e che vogliano avere delle opinioni altrui. L’opinione su di un libro è molto soggettiva e per questo leggere eventuali recensioni negative non ci dovrà frenare dall’acquisto, anzi dovrà spingerci ad acquistare il libro in fretta per poter dire la nostra ed eventualmente smentire quanto commentato da altri, contribuendo ad arricchire più possibile i commenti e dare sempre più spunti di confronto al pubblico online.